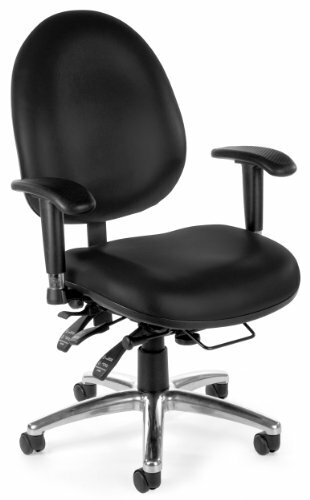 This OFM 24-hour multi-shift chair provides comfortable, ergonomic support 24 hours a day, seven days a week. It's designed to withstand constant use, making it a perfect choice for health care, law enforcement, dispatch and more. The multiple ergonomic adjustments allow incredible custom configurations and precise positioning for comfort hour after hour. Multiple back adjustments including depth, tilt and tension, and height maximize comfort for any body type; a gas lift seat height adjustment, smooth seat tilting action and one-touch sliding seat depth adjustment provide additional customization. The arms are adjustable in both height and width for maximum upper body support. The comfortable padded back and thick 3" seat are upholstered in anti-microbial, anti-bacterial vinyl that's easy to keep clean even in heavy use environments. The chair is supported by a steel 5-star wheeled base for stable mobility. This model meets or exceeds industry standards for safety and durability, and is backed by OFM's Limited Lifetime Warranty.